Headaches, digestive problems, breathing difficulties etc.., that not only affect health but the productivity too. in front of computer or laptop. How to sit with Proper Body posture in front of Computer? Here are few easy steps to adjust the attributes like document holder, viewing distance, monitor angle, seat back angle, seat height, arm & wrist angle, mouse height, mouse & monitor height for comfortable health & work station. 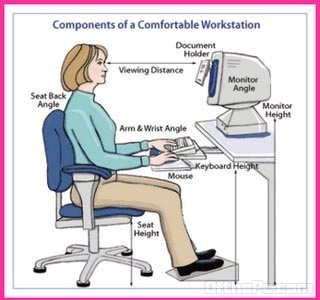 First of all it is important to adjust corresponding height of chair and table desk for proper overall body posture comfortable to you while sitting and work on computer, since height of each individual is different. 3. Use proper good quality office chair with comfortable back to prevent any physical pain as you sit on the chair for long time. Your waist should remain straight while you sit on chair in front on the computer so adjust back of the chair accordingly. 5. Don’t lie down on bed or on the floor while using laptop or portable computing devices. Avoid placing laptop on your lap – this can result in excessive heat and may cause burning sensation. Placing the laptop on the table is recommended; use them in proper position while sitting on chair.